Normally speaking, when Our Lord Jesus Christ destines graces for a certain social milieu, He demands suffering from those who belong to it. Why do we need such suffering? He asks it from us because it is by suffering that we participate in a very small measure in His infinitely precious Redemption, which brings its fruits to our social group. Once I heard this explanation of the symbolism of the Offertory in the Mass. In the Offertory, the priest first pours wine into the chalice. 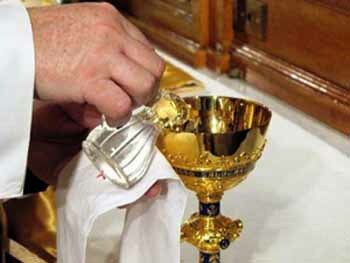 Then he pours a single drop of water into the chalice to be mixed with that wine. 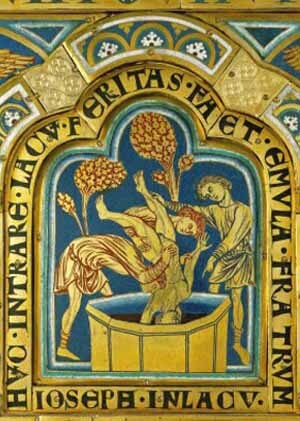 The wine and water become a single element, which is then transformed at the Consecration into the Blood of Our Lord. That drop of water symbolizes our human sacrifices, while the wine symbolizes the human-divine sacrifice of Christ. The small part is the water, that is, a liquid without value, but that drop of water is also transformed into the Blood of Our Lord. It is a beautiful symbol showing that our sacrifices are accepted by Our Lord to spread the fruits of His Redemption. What kind of suffering does Our Lord and Our Lady ask from us so that the apostolate may give fruits? Each man has his own social milieu that influences him and that is also influenced by him in one way or another. When a person begins to adhere to the Counter-Revolution, this social ambience often treats him with brutality or disdain. It cannot be denied that one of the most pungent sufferings a person can have comes from the feeling of being rejected by those who are his relatives and friends, by those who form the inner circle to which he belongs. These are the ones who should receive him as one of their own, but instead they reject and scorn him. This suffering is so real that in the Gospel of St. John, one of the first things that he points out about the mission of Our Lord Jesus Christ is that He came unto His own, and His own did not receive or recognize Him. 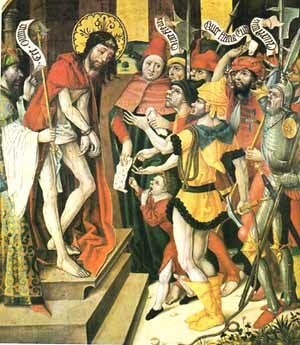 He should have been received and glorified by the Jewish people, but instead He was rejected and crucified. The light shone in the darkness but the darkness did not receive it. This rejection is a dominating fact in the life of Our Lord Jesus Christ, and it is a real cause of suffering. So great is this suffering that if a person does not suffer from rejection by his social milieu, then something is wrong with him. If a person says, "It doesn't bother me to be rejected by the others," then I think, "Something is wrong with him. It should bother him. It should cause him suffering." There is no merit, courage or heroism in enduring something that does not bother us. If Our Lady asks us to suffer these rejections by our social milieus, it is because it is hard and she wants us to grow in fortitude, courage and heroism. Imagine a person who becomes sick but feels no pain even though he should be experiencing intense suffering. If he does not feel any pain, we cannot say that the person is heroically bearing the suffering of the disease. If we are rejected by our own social milieu, if we are treated badly, if we are ostracized, if we are treated with injustice and deliberate misunderstanding by those who are called to understand us and lend us a hand in our hour of need, it should cause us suffering. It is normal that this rejection be painful, and there is merit in enduring it for the love of Our Lady. The Gospels are filled with episodes witnessing how the Jews, Scribes and Pharisees rejected Our Lord. He suffered because those whom He came to save did not receive Him. Likewise, anyone who wants to be an excellent Catholic, who enters the path of the Counter-Revolution, who takes the intransigent position of constant combat for the Holy Catholic Church in these days of the total dominion of the Revolution, should expect to suffer ostracism and rejection. This rejection produces a form of intense moral suffering. It is bothersome and heavy to support. It demands a lot of courage from us to endure it. What is the reason for this? First, because everything that violates or clashes with the human instinct causes suffering. Now, man has an instinct of sociability. Sociability does not mean just to live among many persons, to live in a group like a person lives in a condominium or like a number in the masses. The instinct of sociability calls for an interchange of warmth, affection and a certain intimacy within the restricted circle in which a man lives. With this specific group of people, he has a harmonious and agreeable conviviality that fulfills his psychological need for receiving and giving support. In the past the most terrible punishment a man could receive - when men were individuals and not anonymous numbers in the masses as they are today - was to be exiled from the social group to which he naturally belonged. When this happened, a man suffered intensely because he was denied something that his nature requires. The need for conviviality is not a physical need: it is a moral and spiritual need. Spiritually, a man needs this conviviality, and when it is denied him, it produces a profound suffering. So, when we adhere to the mentality of the Counter-Revolution, when we are real Catholics in a world that refuses the Catholic Church and the spirit of the Counter-Revolution, when we take a vanguard position holding high the banner of the Catholic cause, we should not be surprised to find that we are persecuted and ostracized. When a person takes the first steps in the counter-revolutionary life, he usually has to face the hostile environment of the Revolution. But even in normal circumstances, to support the isolation of being different from the others and not being accepted is extremely painful. There is another side to this rejection: it is being the object of an injustice. We see in the life of Our Lord that He was rejected principally because of His mission. The counter-revolutionary experiences something similar. Our Lord came to deliver us from the weight of Original Sin and allow man to enter Heaven. The counter-revolutionary message denounces the great plot of the Revolution against Christendom and the Catholic Church; it shows man how to defeat it and effectively begin to do so. Catholics should receive this message well. It is a question of justice. When they reject it, justice is wounded. When the sense of justice – which lies in the heart of every man – sees an injustice being committed by this rejection, the normal reaction should be indignation. Unfortunately today there is great indignation when the personal interests and rights of a person are touched. This is what normally stirs our sense of justice. But we should also react with indignation when the rights of God are offended. For the true counter-revolutionary, the greatest suffering he has to face in his daily apostolate is to see that he brings the message of the Counter-Revolution, which is the message of Our Lord Jesus Christ, and it is rejected. By his words, certainly, but also by his way of being, his way of speaking and dressing, his demeanor and actions, he brings a message of Our Lady to his social ambience. He represents this message for his environment, and this message is rejected. He should realize that the personal rejection he feels is neither the greatest suffering nor the greatest injustice. He is bringing to the people around him high and sublime principles. He carries with him a perfect Catholic ideal, a vision of the order that can resolve their problems; he has the eternal revealed truths of Our Lord Jesus Christ that open the doors of Heaven to their souls. He represents in many ways those principles which are the foundation of all order, decency and goodness that he wants to transmit to others, and he sees both the message and the messenger being ignominiously refused. This ignominious refusal makes the apostle of the Counter-Revolution share the suffering of Our Lord Jesus Christ in His Passion, where He experienced those rejections and previewed ours. For a true apostle of the Counter-Revolution, seeing this refusal should be a suffering: a suffering followed by indignation. He should feel an indignation at the injustice of this refusal of Our Lord Jesus Christ, of the principles of order, hierarchy and beauty. There is no manner to justify that this message of Our Lord Jesus Christ be treated in such a way. We should be indignant at seeing His glory obfuscated, tread underfoot and ridiculed by general hatred, indifference and mediocrity. It is a true indignation, but one without personal bitterness. I believe that unless one becomes indignant at seeing the interests of the Catholic Church and Christian Civilization tread underfoot, his spiritual life is not what it should be. This indignation should be calm, stable and always present, for it represents his love for Our Lord Jesus Christ, Our Lady and the Catholic Church. This is the reaction of an ordered soul that follows the principles and values Our Lord Jesus Christ represents. Our Lord is the supreme good of his life and the focus of all his considerations. Thus, he suffers because of his love for Him. He sees the Catholic Church, the only true Church, the Mystical Body of Christ, being rejected by those around him and by society in general, and he suffers for that. I am afraid that a person who sees this and does not become indignant does not have a true love of God.